EMT Practice Tests are an excellent way to prepare for your upcoming EMT exam. The sample questions in our EMT practice exams simulate the actual questions you will see on your exam. Our sample exams require no registration, and include scoring and answer explanations. EMT practice tests are an effective way to study for your NREMT exams. Our free EMT practice sample tests provide you with an opportunity to assess how well you are prepared for the actual EMT test, and then concentrate on the areas you need to work on. Get started now...and good luck! For More Study Tools - see Test-Guide.com's Recommended EMT Study Products to improve your chances of passing. Test-Guide.com's sample test questions are categorized to help you focus your study. Each question will have four possible answers to choose from. The questions are similar to what you can expect on the actual EMT exam. After you submit answers to the sample questions, a test score will be presented. In addition, you will be given explanations to all of the questions to help you understand any questions you may have gotten wrong. The EMT and NREMT tests are computer adaptive tests which require EMT candidates to thoroughly know the fundamentals of EMT practice. Computer adaptive testing will vary the amount and type of questions that you receive based on how you have answered previous questions. Candidates will be presented with a range of questions depending on the particular exam certifiction that they are testing for. Your exam will end automatically once it has been determined wheter you passed or failed the exam (to a 95% certainty level). After you complete your exam, you can go to the NREMT website (nremt.org) to receive your test score. If you have failed your exam, you must wait at least two weeks before reattempting the test. You will also be required to pay another test application fee. 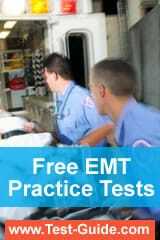 Preparing for an EMT exam by using free online EMT practice tests is an effective way to study. The more EMT test questions that you practice, the better able you are to pass the real EMT test. All EMT’s are required to pass licensure and certification exams either from your state EMT licensing authority or from the NREMT. EMT salary ranges are often determined by an EMT's certification level. There are various levels of EMT licensure and NREMT certification including First Responder, EMT-Basic, EMT Intermediate and Paramedic. Preparing for your EMT test by studying EMT test questions and taking NREMT practice tests is an effective way to insure your success on whatever EMT exam you are taking. EMT positions are always in demand. Becoming an EMT is a great foundation to career in a medical field. EMTs go on to become paramedics, nurses, nurse practitioners, and even doctors.